ID Card Maker utility provides the simple and smart methods to generate preferred style identity cards in various formats for different types of users such as Student, faculty, staffs, employee, visitors, security and other professional users. 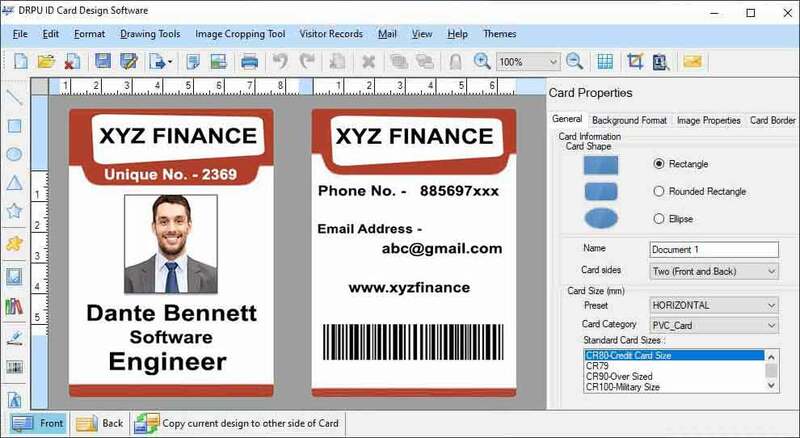 Card designing tool supports variety of card generating objects like pencil, picture, text, rectangle, ellipse, arc and star to design customized ID cards. Users can print most effective cards by using advanced print settings and print preview functionality without any printing mistake. ID card maker program supports simple and user friendly working environments to easily operate and design identity cards by any category of user. User can print bulk copies of ID cards in minimum time and save generated cards in their system for further printing or future reference. Card generator program supports outstanding features to design standardized ID cards with adding photo, image, text, logo and barcode. ID card maker software is beneficial for small to large scale organizations to print ID cards for their users in short time and low cost. Software provides excellent features to print beautiful and nice looking ID cards with wonderful background and multiple colors. User can download trial version of the software to test the features and functionality of the software before purchasing. Software helps users to design identity cards by modifying existing cards saved in the system or start new with blank format. Software Features: * Most efficient and specialized tool to design high quality identification cards for different types of professional users. * Provides facility to add various elements in cards like photo, logo, images, barcode and logo to make more attractive. * Enables users to generate ID cards in different style like ellipse, rectangle and rounded according to their choice. * Supports smart printing features to print bulk copies of identity cards with great background and gradient.